Morphological Snakes  are a family of methods for image segmentation. Their behavior is similar to that of active contours (for example, Geodesic Active Contours  or Active Contours without Edges ). However, Morphological Snakes use morphological operators (such as dilation or erosion) over a binary array instead of solving PDEs over a floating point array, which is the standard approach for active contours. This makes Morphological Snakes faster and numerically more stable than their traditional counterpart. There are two Morphological Snakes methods available in this implementation: Morphological Geodesic Active Contours (MorphGAC, implemented in the function morphological_geodesic_active_contour) and Morphological Active Contours without Edges (MorphACWE, implemented in the function morphological_chan_vese). MorphGAC is suitable for images with visible contours, even when these contours might be noisy, cluttered, or partially unclear. It requires, however, that the image is preprocessed to highlight the contours. This can be done using the function inverse_gaussian_gradient, although the user might want to define their own version. 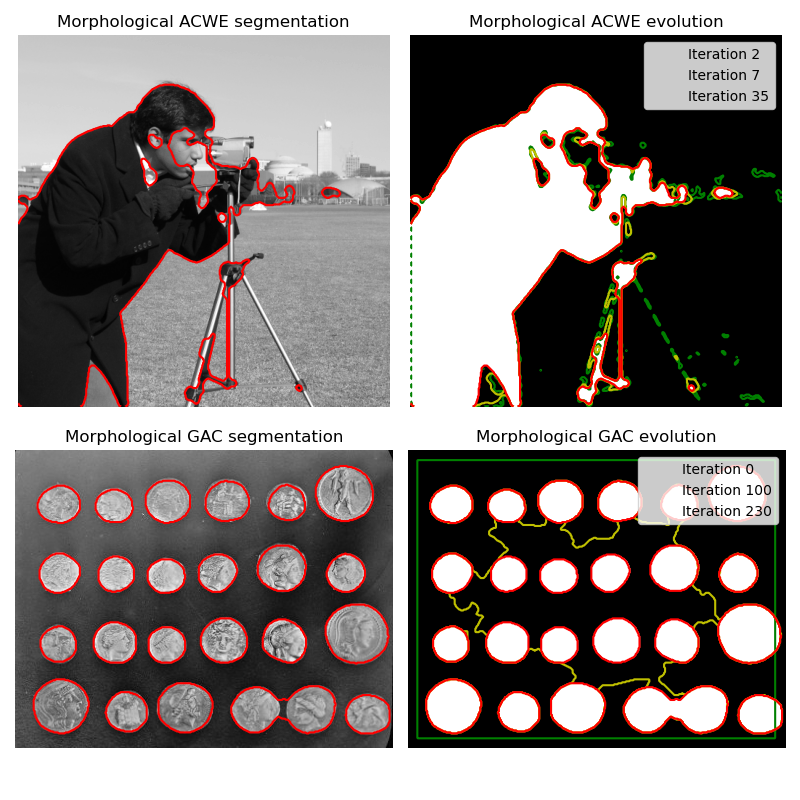 The quality of the MorphGAC segmentation depends greatly on this preprocessing step. On the contrary, MorphACWE works well when the pixel values of the inside and the outside regions of the object to segment have different averages. Unlike MorphGAC, MorphACWE does not require that the contours of the object are well defined, and it works over the original image without any preceding processing. This makes MorphACWE easier to use and tune than MorphGAC. title = "Morphological ACWE evolution"
title = "Morphological GAC evolution"